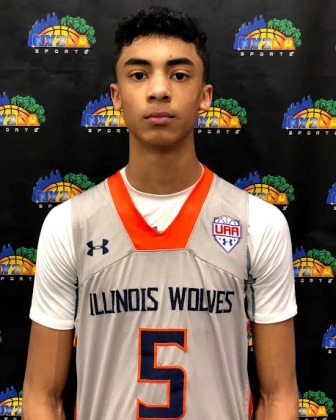 As 2021 prospects go the Midwest is home to some of the best and the state of Illinois is no exception to that rule as they have a couple of strong up and coming sophomores with elite national potential. One such talent is guard Max Christie of Rolling Meadows High School in Rolling Meadows, Illinois. A top 25 caliber national recruit, Christie is a gifted 6-5 near 170 pound plus shooting guard with plus length and advanced skill. A natural scorer with the ability to finish at each level, Christie is a multi-dimensional talent whose ceiling is extremely high. He can handle the ball, he has an excellent feel for the game that allows him to make quality decisions with the ball in his hand. He can create or score when needed and his athleticism has continued to develop allowing him to elevate in transition and finish through traffic on occasion. While the primary focus right now is on the Class of 2019, Christie has already generated quite a buzz at this stage as the Rolling Meadows standout currently holds offers from DePaul, Illinois, Iowa, Loyola-Chicago, Northwestern, Purdue, and Wisconsin. Still only scratching the surface, Christie is primed to develop into a potential top 10-15 caliber prospect nationally over the next couple of years and you can expect his recruiting trail to fill up substantially in the process. Christie played with the Illinois Wolves during the grassroots travel season.